When you have a single charging hub station with multiple USB ports, you can charge all your devices at the same time without having to wait for one device to get full before charging another one. There are some lower quality charging hub stations that get too hot and have problems due to overheating. Some of them also fail to charge devices fast. But today, there are new products from trusted brands like Anker that are changing all these. With these products, you are guaranteed optimum reliability and speed in charging your electronics. 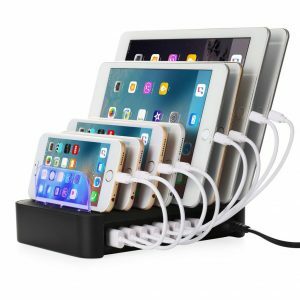 In this article, we shall show you the best charging hub stations that come with built-in protection for better protection of your devices. 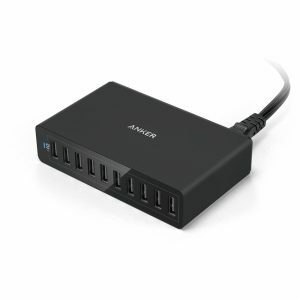 This 10 USB Port wall charger from Anker is a robust and compact charger that offers about 2.4A from each USB port for fast charging. With the 10 USB ports that it comes with, it can charge 10 devices simultaneously. It is a 60W device, and it uses Anker’s VoltageBoost and PowerIQ advanced charging technology. It has a special safety system to prevent excess voltage and current. The Vogek 6-port charging puck comes with a round design instead of a square shape like most other ones. It is flat and small, and it has a non-slip pad at the bottom that makes it portable enough to stay on your coffee table or on your desk. At a price of less than $20, it can charge six different devices, and it comes with nice docking stands. You can dock various tablets, phones and other devices in the docking stands. It charges at 2.4A. This is fast enough for most devices. The only downside of this charging dock is that it doesn’t come with Quick Charge. 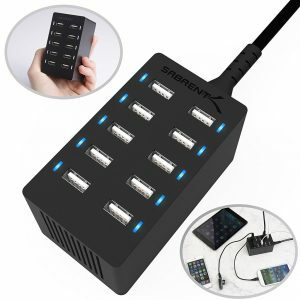 The Sabrent 10-Port 60W family charger is a very portable charging hub station that can fit into your hands. Yet, as small as it is, it supplies over 60W of power through ten USB ports. Yes, you can charge 10 devices with this charging hub station. As the name ‘family charger’ implies, it is a perfect charger for a family. The Sabrent family charger comes with overvoltage, overcharge, safeguards and autodetect technology to protect your devices. Apart from the 10-port model, you can also get the family charger in 4,5,6, and 8-port models. 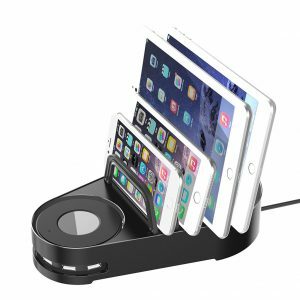 The Nexgadget Universal Detachable Multi-Port USB Charging Station comes with 8 USB ports. Each USB port comes with a smart built-in IC that can recognize the devices that are connected to the ports and charge them with an optimal charging voltage. 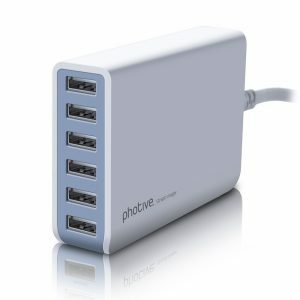 The Photive 60 Wat 6 Port USB Desktop Rapid Charger is a powerful charging station with a variable voltage of 110V to 220V which makes it possible to use it anywhere in the world. It has 6 USB ports and 12A current overall. It comes with built-in protection against overheating and overcharging.